Tomorrow night! I'm excited for this one ladies! After that we are meeting with a potential Reverend in July. I also want to decide and finalize GM, RB, & FG attire this month. I have also tackled the invite department. I thought I had them picked out. Then I orded a sample and just wasn't in love with them. I will keep looking but I think I'm going with Cards & Pockets online. Seems to be the best deal for what we want. What's everyone's wedding to do's for July? You are so lucky, you get to do cake tasting now!! Enjoy that, I heard it's one of the funniest things to do! What is the RB? I hope you like the Reverand. Personality for the person marrying you is important. Make sure you have a good vibe from him or her!!! Jeff and I booked the videographer last night! Next week meeting with a non denominational justice of the peace. Also I am pretty sure I found my makeup person! I'm doing my cake tasting a week from today!! So excited. 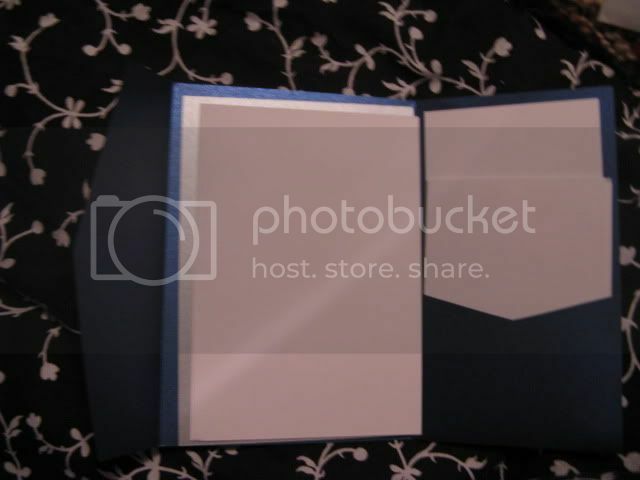 And Cards and Pockets.com is an excellent choice for invitations. I ordered a sample from them last week and I am absolutely in love! Can't wait to put the invites together. My main to-do for July is to actually send out STDs! I got my email proof today and it looked good! Hopefully they'll come in by the end of next week. Other than that and the cake tasting, nothing too major that I can accomplish right now. We'll probably try to meet with our DJ at some point this month to work out our song selctions and I'd like to finalize GM tuxes, but those can wait until August if necessary. I think I'll use this month to try to figure out centerpieces and other decorative elements. My goal for July is get the invitations done, figure out a honeymoon destination, and make a decision on our favors. Have so much fun at the cake tasting! We had a good time with ours. I just got our confirmation packet in the mail from our baker today. Sasam - please post pics of your invites if possible. I'm ordering a sample from them tonight. I'm having trouble putting a PIP so here is a link to pics I uploaded on my photobucket. I ordered the Signature Pocketfold mock-up kit. 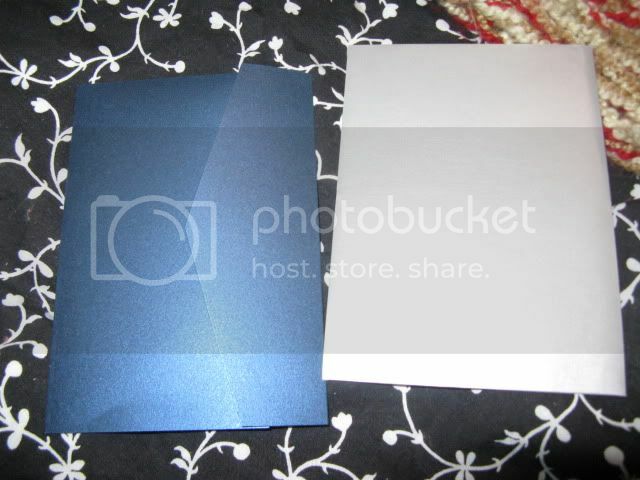 The pocketfolder is Sparkling Sapphire and the envelopes are silver (metallic).The sample comes with several enclosure examples so you can try out different sizes and whatnot. I can't wait until I can order all the kits! I'm so glad you are doing so much! Congrats! The cake tasting is the best. We did it last week and it was awesome. Those invites are so cute! I love the matallics! I can't wait to get my samples in the mail. I think that site is a really good deal. They even have a print shop. I'm jealous that you get to go do a cake tasting. I haven't gotten that far yet. Since I don't live in the same state that I'm getting married, I'm sending my mom to the caterer tasting. Hopefully I'll have a caterer soon and then maybe on the next trip I'll get to taste a cake. I really don't want to miss that!!! Our save the dates are complete and I love them. They will go out next week. For July I hope to finalize vendors (caterer, photographer, DJ). After reading all of your replies I'm nervous that I'm behind. Oh well. Its January in PA, no one I speak to is booked yet, hahhaha.